The City of Eunice built a walking park with 2 bridges. The foundation of the bridges were undermined by nutria burrowing on the banks of the coulee. In May 2016 the City of Eunice asked TRAIL for assistance with the repairs. 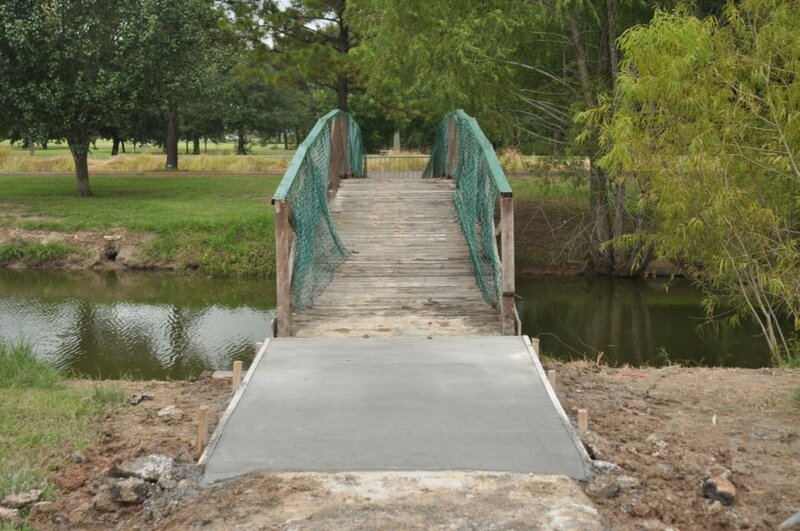 TRAIL partnered with the Rotary Club of Eunice to fund the repairs to the bridges and other improvements to the park. This project and partnership was initiated through the relationships built over the years through the various events put on by TRAIL and the Rotary Club of Eunice (Zydeco Triathlon & Experience Louisiana Festival Bike Ride). FUTURE: All parks have an ongoing maintenance needs and the commitment from the Rotary Club of Eunice and TRAIL will help keep improvements happening at this park. Next phase of improvements includes painting, installation of bench and bike racks. If you would like to make a contribution directly towards supporting the Eunice Walking Park, you can make a donation using the PayPal here.